Back in April 2017 Twitter introduced its data-friendly platform called Twitter Lite. For quite some time it was only available as a bookmark that acted as an app through Google Chrome, but eventually, in December it was launched as a separate application on Google Play in 24 markets. Today Twitter Lite hits 21 more countries, including India, the company announced in a blog post. 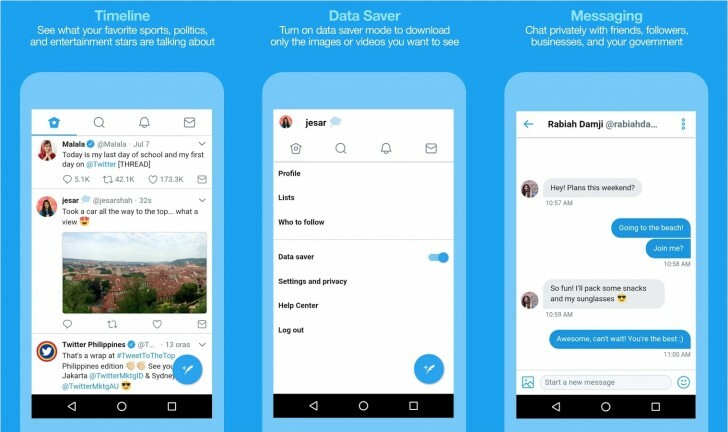 Twitter Lite offers features like Data Saver that allows you to see only images that you want and does not load every gif and jpg file all the time. You can save threads and tweets for later, you can receive push notifications and there is a night mode that is easier on the eyes (and on AMOLED displays, although these are hardly popular among users of lite apps). The full list of the 21 new countries includes Argentina, Belarus, Dominican Republic, Ghana, Guatemala, Honduras, India, Indonesia, Jordan, Kenya, Lebanon, Morocco, Nicaragua, Paraguay, Romania, Turkey, Uganda, Ukraine, Uruguay, Yemen, and Zimbabwe. Users can simply download the app from Google Play that is only 3 MB in size. Amd its sooo cheap we cant complain... hahah like for effective INR130 we get unlimited national calls (India is BIG ), sms and 1.5gb "4g" internet.... happy !! !